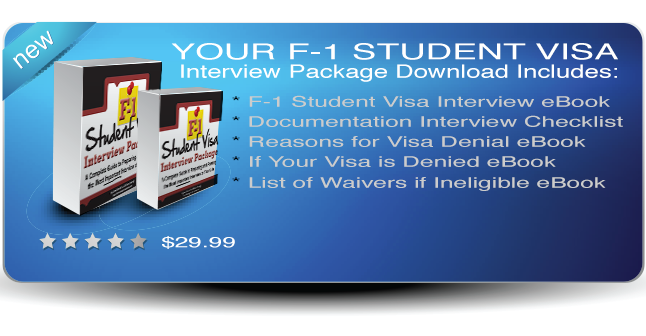 Don't Risk Getting Denied Your Student Visa! This brand new eBook is the most current and accurate available right now - it contains over 75 pages of detailed information all about preparing for and passing your F-1 Student Visa Interview. And to make sure you get approved, it comes with an additional 50 pages of Bonus Materials - free! Everything you must know about scheduling your interview, what questions you will be asked, what to say (and NOT to say) to ensure you are approved, what will the environment be like in the Consulate/Embassy, and most importantly - what to do if you are Denied and how can you legally get a waiver so you can try again? I personally guarantee your money back if you are not completely happy with this eBook and it doesn't help you feel confident and prepared for the most important interview in your life! Order Now and Download Instantly for $29.99! !